Mix flour and paprika together on a large plate. Beat eggs with salt and pepper in a shallow bowl. 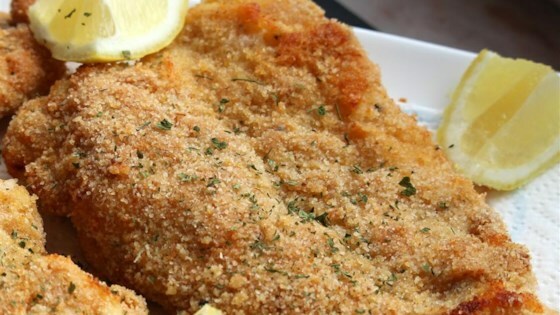 Mix bread crumbs and lemon zest together on a separate large plate. Dredge each chicken piece in flour mixture, then egg, and then bread crumbs mixture and set aside in 1 layer on a clean plate. Repeat with remaining chicken. A classic healthier version of a family favorite. You can also use panko or season your own bread crumbs. My 11 year old daughter made this and my husband loved it!